The setup: The player is given two indistinguishable envelopes, each of which contains a positive sum of money. One envelope contains twice as much as the other. The player may select one envelope and keep whatever amount it contains, but upon selection, is offered the possibility to take the other envelope instead. The puzzle: The puzzle is to find the flaw, the erroneous step, in the switching argument above. This includes determining exactly why and under what conditions that step is not correct, in order to be sure not to make this mistake in a more complicated situation where the misstep may not be so obvious. In short, the problem is to solve the paradox. More background– and the answer(s)– here. For those who finish early, Plan 9 from Outer Space, the epic Ed Wood, Jr. epic (aka, “the worst movie ever made”) is being hosted in its 78-minutes-of-black-and-white-incoherence for free here on Google Video. (Hint: there’s nothing Bayesian about it.) Watch, too, for the remake— 9.9.09… just in time for the 50th anniversary of the original, and including Conrad Brooks, the sole surviving member of the original cast/crew. 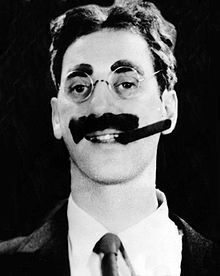 As we count our change, we might say the magic word and collect $100, as it’s the birthday of Groucho Marx, born this date in 1890.